Designing solutions to complex problems is a messy process. This process involves a deep understanding the current state and available resources, the many stakeholder’s values and goals, and the core question that leads to novel ideas. When prompted with the question of how technology might more quickly reconnect parents with a lost child at an amusement park, I immediately made many assumptions. My mind raced to obvious solutions before I stopped myself. I recognized that I really don’t know much when it comes to the many sides of this issue. I am neither a parent nor an amusement park aficionado. I have never worked in park operations, nor been a missing child. Like many past projects, I took this opportunity to speak with experts to better understand where mobile technology might provide the most benefit. I began to think of places where children often get lost. Like amusement parks, I imagined places with a bunch of hustle and bustle, interesting and playful things to explore, and lots (and lots, and lots) of kids. 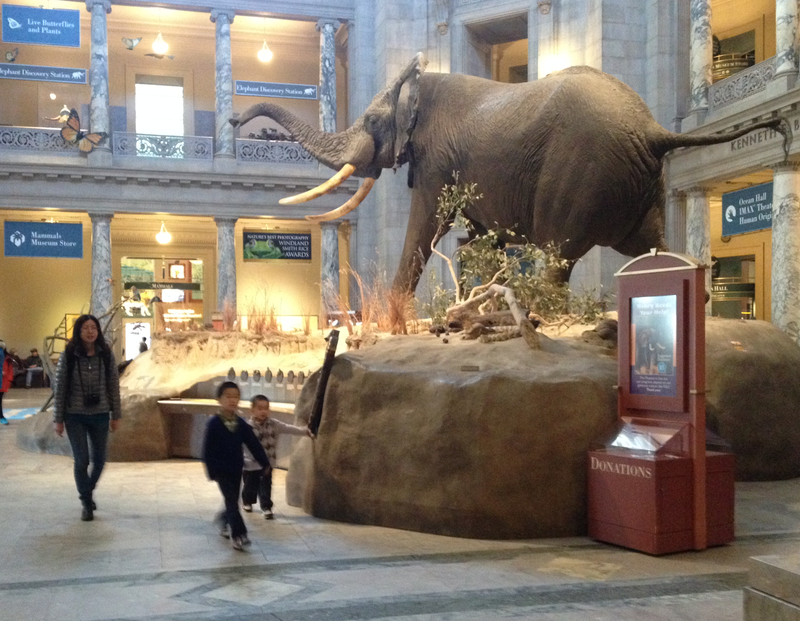 My friend Jesse Alleva and I took the train down to Washington DC to observe human interactions and speak with experts at the Smithsonian Institution’s National Museum of Natural History. I knew that by working with a friend, we would catch more subtle inferences, be able to build off each other’s questions, and share key insights. » In a moment of panic, people seek human interaction. » You cannot rely on cell service; the most reliable communication may be radio. » Children often seek help before parents or guardians; kids know to seek out security guards. » Language may be a barrier. During this visit, Jesse and I also befriended a Senior Vice President of the National Aquarium. He also knows a thing or two about this topic. When we asked him about how technology might help parents reunite with their lost kids 10 years from now, his mind immediately went to improving facial recognition software. He didn’t shy away from unconventional ideas, though – when discussing a “retina scanner” for your foot (that can identify an individual by shoe size, tread, and wear and tear), he hopped on board. He added how footwear tracking in a museum might provide a similar research benefit as eye tracking in the digital world, leading to more precise metrics on which exhibits were successful and which weren’t. I also opened up this conversation with my sister, Sarah, a PR professional and mother of two who will soon be taking my nieces to Disney World. When I shared the challenge, her mind started racing and we began building on each other’s ideas. Sarah let me know about Disney’s new Magic Bands, which could make the realistic implementation of a lost-child system really easy – though it would require the children to wear a device. These MagicBands help patrons keep track of nearly everything – hotel and theme park access, FastPass reservations, meal plans, and more. 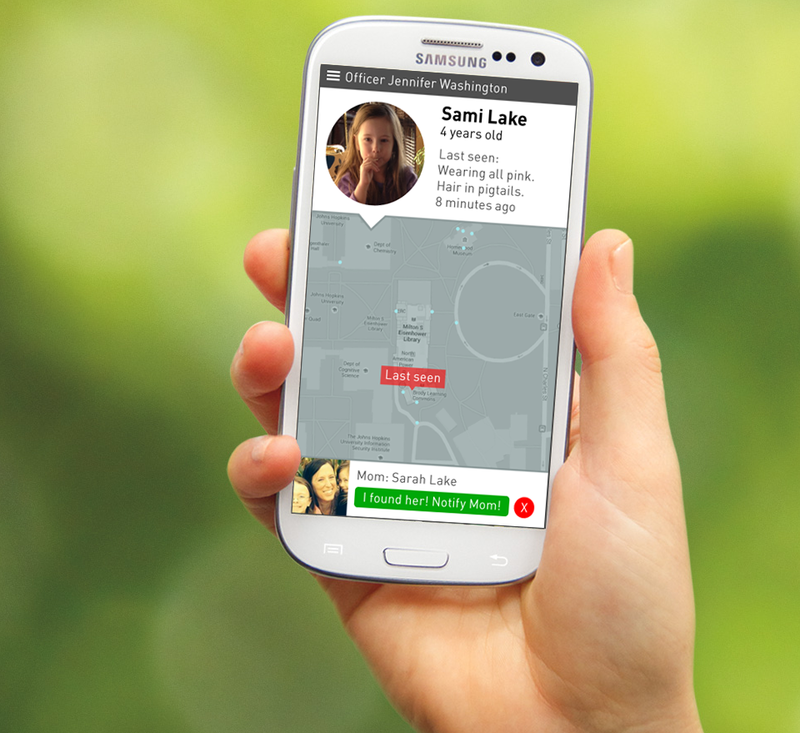 Simply adding a notification to ping a parent’s cell phone – either through an app or SMS messaging, depending on the snazziness of the phone – could allow a parents to know their child’s location. Leveraging the analogous university emergency blue light system, parks like Disney might create visually distinct check-in location that notify both parents and trusted staff of a lost child’s location. If a child checks in at a “blue light” nearby staff could step in to ensure the child’s safety until her parents arrive. If parks were unable to afford MagicBands, a simple playfully designed emergency button might suffice – as long as it only alerted all staff once a child was confirmed missing (pushing buttons can be quite fun, creating many false alarms). 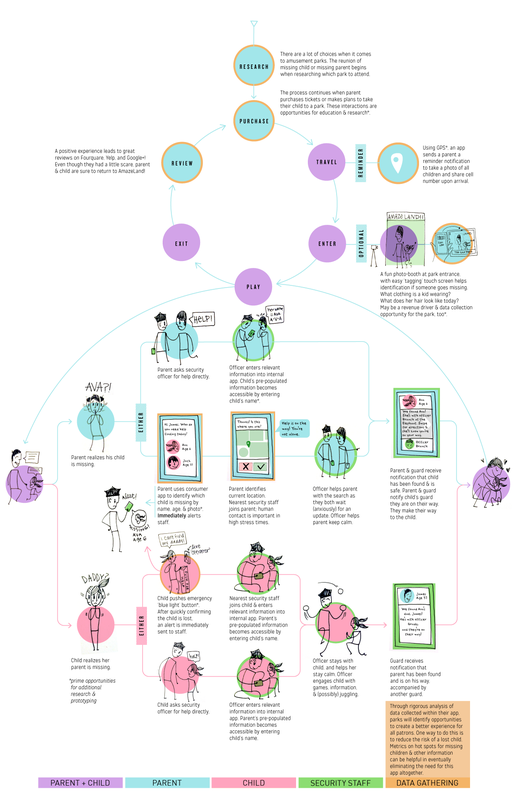 What I have gathered from this research is that any mobile interaction for a parent must be dead simple – the digital equivalent of shouting for help. A consumer app or physical touchpoint is merely one avenue for a parent or child to enter data into a robust park-wide information system; the initial point of contact will more likely be a frantic face-to-face interaction with a staff member or security guard. The back-end of this system, the part the parent never sees, is where the really interesting things happen. It cannot rely on a wireless signal to be successful; it must be designed over a secure intranet or Bluetooth. The intricacies of this more complex back-end system would need to be developed with additional support from experts within park operations. The more data that could be gathered in every lost child scenario, the more insight the park would gain into this situation. By using the app to both reunite parents and children, and gather large sums of data, we can hope that one day the app might no longer be needed. Similar technology that helps Target know a teen is pregnant before her family, helps Amazon send books before you place an order, and helps Google know what you’re thinking before you can type it, can help reunite a lost parent and child before either goes missing. I thrive on harmonious collaboration and would always choose to work on a team of driven, interdisciplinary experts, than attempt to go it alone. My team for this project included Jesse Alleva, Sarah Lake, Kyle Peppers, The Smithsonian Institution, and The National Aquarium.